Flowers are starting to bloom around Epcot where Jack Frost took his toll. 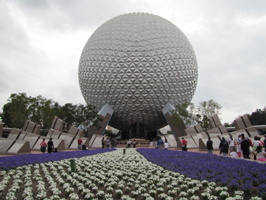 The purple and white flowers in front of Spaceship Earth are looking great! (below, left). 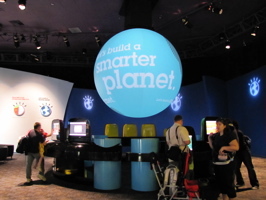 There was a lot of rain today, and part of my time was spent inside creating an avatar of myself to play in the new Innoventions IBM offering called “Run Time” as part of the Smarter Planet exhibit (below, right).